In this persuasive letter, middle-schooler Andrea Rodriguez seeks employment. Your accountant, Rusty Silhacek, is my neighbor. He mentioned that your office stays very busy, so I wondered if you could use some extra help. I would like to apply for a position as a part-time veterinary assistant. As far as animal care goes, I’m experienced in feeding, bathing, exercising, and cleaning up after small and large animals. I truly love animals and have always given them special attention and care. I would be available to help after school and on weekends. I would be happy to come in for an interview at your convenience. You can contact me any weekday after 3:00 p.m. at 523-4418. Thank you for considering my application. 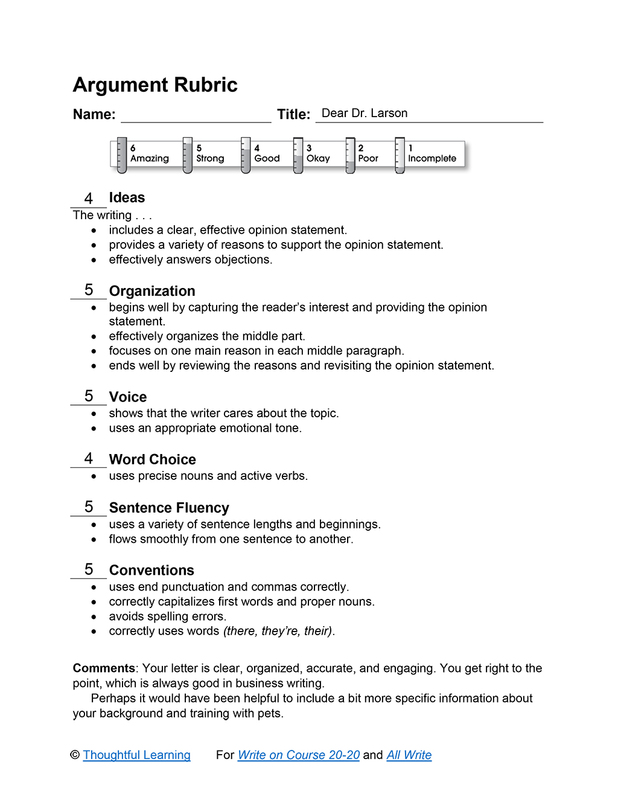 Dear Dr. Larson (Strong) by Thoughtful Learning is licensed under a Creative Commons Attribution-NonCommercial-ShareAlike 4.0 International License. Based on a work at k12.thoughtfullearning.com/assessmentmodels/dear-dr-larson-strong.